PETER BOSZ SAYS his side must “play the Ajax way” in order to upset Manchester United in the Europa League final. 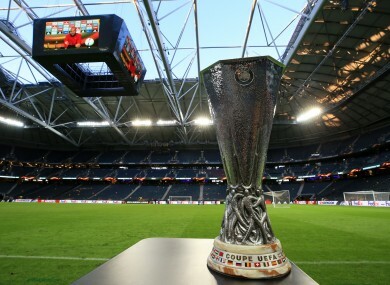 Amsterdam giants Ajax have impressed with their swashbuckling, attacking style of play en route to reaching the Stockholm showpiece, with a pulsating 5-4 aggregate victory over Lyon in the last four booking a spot in the final. The clash against the Red Devils has been billed as a clash in styles, with Bosz favouring his young side to take the game to their opponents while Jose Mourinho’s United are perceived as more cautious. And Ajax coach Bosz has demanded his team stay true to their principles in the Swedish capital. “Of course, we got to the final with a certain way of playing. It’s our forte,” he told a pre-match news conference. “We will try not to change anything. We have to play an opponent, depending on the opponent they can make you play differently. “With your team you discuss all scenarios. It depends how strong we are. We’ll be strong enough to play this way. “The only way we have a chance to beat Manchester is if we play our own game. We have developed a way of playing that I call the Ajax way. If we play that way, we have a chance. Much has been made of the youth of Ajax’s squad and whether the occasion may overawe Bosz’s side. But the head coach says it would not be normal if his side did not feel the nerves given the scale of the match. “I would send them immediately to the doctor should they feel no nerves!” he joked. “It’s not normal, remarkable if they didn’t show nerves. For all of them it is the first time feeling like this. “We have to deal with it. It’s great that we arrived a day early. Nerves are fine, but you don’t want nervousness to prevail. Email “'We'll play the Ajax way': Bosz promises to stick to exciting style against Man United”. Feedback on “'We'll play the Ajax way': Bosz promises to stick to exciting style against Man United”.